Vine Cottage is an ideal base for the biker, the surrounding area is superb for bikers with many beautiful roads to travel. The Sieg and the Nister Valleys are close by, and the better known Rhine and Mosell Valleys only an hour away. 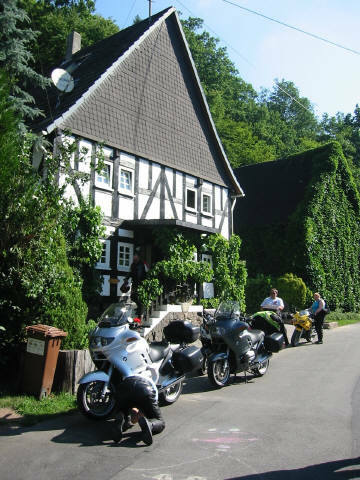 The Westerwald itself is very popular with German bikers and you will be surprised by the many bikers you see on your travels. Some German biking routes can be found here at the Motorrad Touristik web site (translated courtesy of Google). See Tour 1 which takes in Wissen, Hohn, Westerburg, Hackenburg, Hamm returning to Wissem. 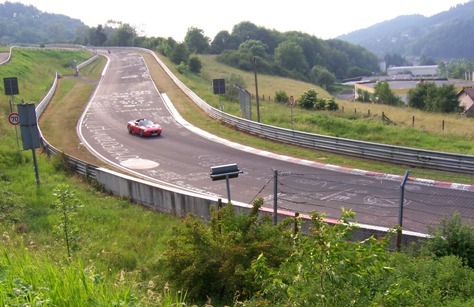 The world famous Nürburgring is also only an hour away. 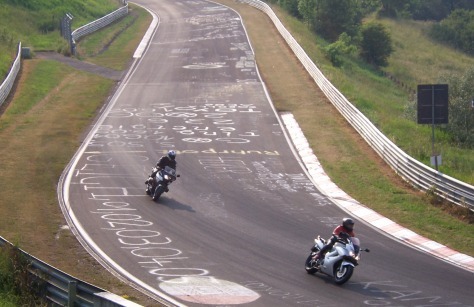 Bikers can test their skills on this Grand Prix circuit. 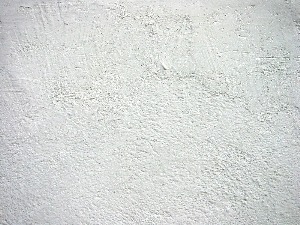 Ben Lovejoy's website provides loads of information about the circuit. How about visiting the Moehne, Eder, and Sorpe Dams made famous by the Dambusters raid? The Mohnne and Sorpe can be visited in a day taking in some fantastic roads, breathtaking scenery and villages. The route goes North from Olpe, Attendorn, Sorpsee, Arnsberg, Mohnese, arriving finally at Soest. The circular route back can be via Meschede, following the 55 south-west to Olpe. Bike security is always a concern, although crime is unheard of in the village we do have off street parking free of charge. If required "overnight accomodation" for the bike can be had in a lockup that is availablle for a small charge. Although the continental weather is invariably better than that of the UK rain is not unheard of. So a drying room is available for leathers etc. in case disaster strikes. Vine cottage also offers a taxi service in the evenings to local restaurants and hosteleries to enable you to enjoy the local food, beers and wines without the problem of drinking and driving. If going out in the evening, after a day in the saddle, seems far to much bother you can always have a beer or a glass of wine from Vine Cottages well stocked bar, choose something from the bar snack menu and chill out. More substantial meals are available if ordered at breakfast.